I was pleased to be involved with my good friend Adam Huber in producing his new book about his remarkable recovery from arthritis. Having got the condition myself, and knowing that one in five of us will experience it at some point, I was especially interested to know how he cured it. Doctors will tell you that you cannot cure it, and the common belief is that you just have to put up with it as best as you can. Not true. Adam found a cure, and this book explains how he did it. He has been free of arthritis for 20 years, and I can tell you that he is a lot fitter at 65 years old than most people are at 40. Having been hiking with him recently, I know how hard it is to keep up with him! If you have arthritis, or know someone who has it, this book could help a lot. Adam not only tells his story, but also describes the treatment in detail. Metabolic Therapy has been used to cure many other illnesses such as ALS and cancer as well. Check it out on his website. I did the cover illustration and the design work. 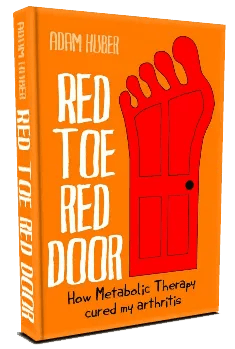 Red Toe, Red Door reveals a triumph of body, mind and spirit over seemingly impossible odds—a must-read for anyone who suffers from arthritis (and some 20% of us will) or any other degenerative disease. Adam Huber has written a refreshingly honest and practical account. Told by the medical profession that there was no cure for his disease and that he would have to take drugs for the rest of his life, Huber chose to fight back—with incredible results. Convinced that the drugs were poisoning his system and not helping at all, he embarked on his long quest for a cure, ultimately transforming his body and his life. His determination and focus led him to experiment with a wide range of modalities and diets, eventually bringing him, in 1991, to the red door that opened up to a remarkable healing process. He has been free of arthritis ever since. Huber takes us through that door, and provides details of the process so that others can benefit from it also. Although this book focuses primarily on arthritis, it has broad implications for every degenerative disease. Based on the remarkable Metabolic Therapy that cured the author and many others suffering from so-called terminal conditions, it provides a blueprint for the reader’s own healing journey, with practical guidelines, suggested protocols and the hard-won wisdom that comes from personal triumph over adversity. Look out for the videos coming soon to Adam’s website (http://www.metabolictherapy.org) where he and others describe their experiences of this remarkable treatment.